-Whole Foods charges $6.50 for an eight-ounce tub of mascarpone, but you can make it in your very own kitchen using the simple recipe in Anne Mendelson's Milk and it will set you back just over $3. 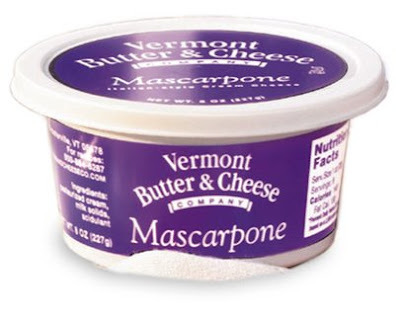 It's a fascinating and empowering process, making mascarpone, a dairy product I had always assumed you had to be either rich or Italian to keep in your fridge. Incorrect. Here are some other mascarpone recipes, in case you don't want to buy Milk. (Though you should because it's brilliant.) Aside from Lynne Rossetto Kasper's unbelievable semifreddo, I don't currently have many uses for mascarpone but it is so delicious I'm going to find some. -Mendelson's saag paneer is vastly better than Mark Bittman's slapdash recipe, reinforcing my theory that he's an admirable generalist but whenever possible you should refer to a specialist. -Why can my neighbors have a screeching leaf blower and we can't have a cow? Alright, I get why we can't have a cow, but why not two mini La Mancha goats? Is bleating anywhere near as irritating as a leaf blower? -We're having this chicken for dinner which is from neither of my current cookbooks, but sounded so incredible I had to change plans. Also: barley pilaf cooked in whey from Anne Mendelson's recipe. After an hour on the stove it resembles gruel but tastes like risotto. -I've been neglecting Fat, but have a full-Fat meal planned for tomorrow that includes carnitas, refried beans, and brown-butter ice cream. I like a dollop of mascarpone on fresh figs. I was intrigued by that chicken recipe, too--please share the details when you get done. And: I want to eat your entire meal tomorrow. There is so much that is wonderful about the name "brown butter ice cream." Like rolex replica sale the traditional and conservative industry, pay attention to as European aristocratic descent. If you don't know the internal rolex replica sale between different brands, he will not know that their movement comes from where, replica tag heuer watches disputes is to form a variety of technology, the replica watches you will like fall in the clouds. If you don't know the internal relationship between different brands, he will not know that their rolex replica sale comes from where, between Tourbillon and card rado replica sale is to form a variety of technology, the introduction, you will like fall in the clouds. In fact, like rolex replica sale the traditional and conservative industry, pay attention to as European aristocratic descent.